Men in dark suits, kickboxing squirrels, mariachi singers … you just never know what might creep out of the shadows during an endurance race. And as you linger on the edge of a cliff, transfixed by the unicorns leaping across the trail, you may experience a brief moment of lucidity and wonder when you chose to trade your sanity for a few measly miles. Personally, I’ve hallucinated phantom rabbits, friends I hadn’t seen in a decade, and an Olympic Super-G skier in the middle of the Alaskan wilderness. Most of these visions I recognized instantly as absurd, and had a good laugh to boost me through a particularly tough time in a race. But my favorite hallucination is one that was so vivid, so moving, that it took me days to realize it couldn’t have been real; and years later, I still sometimes wonder if maybe it was. Looking out across the Farewell Burn at sunset during the 2008 Iditarod Trail Invitational. Photo by Jill Homer. 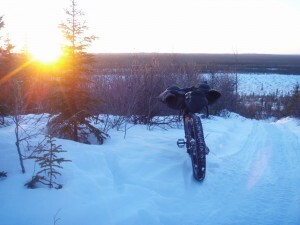 It was about 9 p.m. on my fourth day of snow biking in the Iditarod Trail Invitational, a 350-mile winter race on Alaska’s Iditarod Trail. 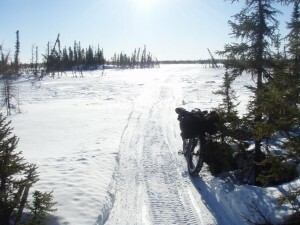 I spent the entire previous day pushing my bike over the Alaska Range, and was struggling to pedal across a frozen valley known as the Farewell Burn. My hip was stiff and sore from a fall on ice earlier in the day, my stomach was twisted in a knot, and I was tapping an energy reserve that I would describe as “catastrophically low.” It was 2008, I had only been racing anything at all for about two years, and I was deeply inexperienced in the ways of endurance. I didn’t yet understand that even when my stomach lurched and threatened to discharge its meager contents, I needed to stuff more calories down anyway. But I hadn’t, and was going on four days of a diet I’d describe as “bits and pieces here and there,” amid sixteen to twenty hours of strenuous activity in subzero temperatures every day. I was nearing the cracking point. To add to my woes, I had crossed into the most remote section of the 350-mile race, nearly a hundred windswept miles between outposts. The snow-covered expanse was sparsely wooded with six-foot-tall spruce trees, and the only other human I’d seen all day was an Italian cyclist who seemed nearly as strung-out as me. Night fell and temperatures dropped below minus twenty, the lowest reading on my thermometer. The Northern Lights came out to undulate hypnotically in the sky, and I could hear a chorus of sounds — howls, footsteps, a rustle of branches — carried by air so still that I couldn’t tell if they were coming from a spot right next to me or a mile away. It was eerie — the scariest place I’d ever been — and I wanted nothing more than the strength to keep riding until I was somewhere safe. But I was tired, so tired, and even the howls of wolves did nothing to spark the adrenaline I so badly needed. The barren expanse of the Farewell Burn. Photo by Jill Homer. Minutes, possibly hours, passed in this muted urgency — too tired to ride, too frightened to stop. As I walked, a black silhouette approached me on the trail. I was terrified of wolves, but this figure didn’t strike me as a wolf. I wasn’t afraid of it; even before I could see what it was, I felt a warm rush of recognition. As it moved into the yellow beam of my headlight, I saw the glowing eyes of a lynx. In a good, definitive hallucination, the lynx would have spoken to me or flown away. But this one just stood in place, looking up at me expectantly, as though it were waiting for me to make the next move. I was mesmerized, turning my gaze from its yellow eyes to its long legs and wide paws, and reaching for comprehension the way a person trapped underwater would struggle for air. “What do you want?” I remember thinking. “What should I do?” Minutes, possibly hours, passed in this quiet standoff, and I might have believed time had frozen as well had it not been for the thump of my heart. The lynx eventually turned and walked away. I raised my headlamp to follow its path, but it had disappeared into the woods. I never thought to look for its tracks. Eventually I attempted to ride my bike again, and again startled myself by waking up in a snowdrift. I decided I had no choice but to stop and rest. I half-consciously stomped out a trench and unrolled my bivy, drifting to sleep with the lynx’s incredible eyes still burned in my mind. For the remainder of the race, as I continued to struggle through low energy and harsh trail conditions, I carried on believing a lynx had come to visit me in the night. 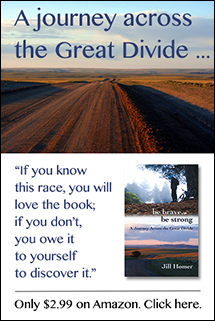 It wasn’t until I’d finished the race, two days later, that I started to deconstruct that moment. “Wait a minute. 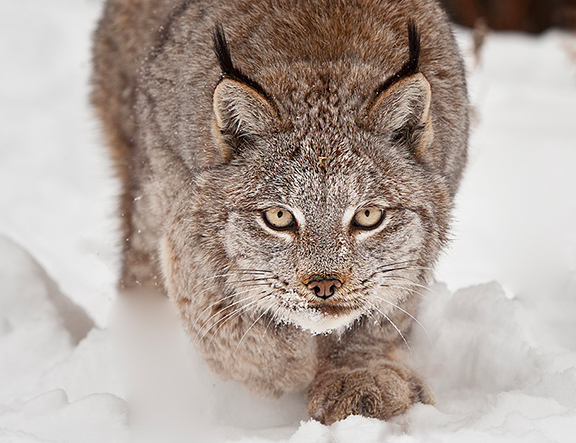 Lynxes are one of the most elusive animals in the North. They don’t just walk up to humans, unless they’re rabid, and even then …” I realized how sleepy and strung-out I’d been, how it could have been a vivid dream when I fell asleep on my bike, or perhaps a waking hallucination. But the notion that the lynx encounter had actually happened was absurd, and this realization filled me with such disappointment that I didn’t tell anybody about the hallucination for a few years. I loved my lynx too much to admit it wasn’t real. Years passed, this fierce love began to fade, and I found enough humor in the moment to start telling my friends my “favorite hallucination” story. But in moments of hardship, I still find myself thinking about that silhouette, those eyes, that all-too-real feeling of comfort and recognition when I was scared and alone. In the past, some Native cultures established a persons’ “spirit animal” based on such experiences. I smile when I think that my spirit animal might be that lynx — even if it was just a figment of my imagination. Jill Homer rode 350 miles from Knik to McGrath, Alaska, during the Iditarod Trail Invitational in February 2008. She wrote about her experience in her first book, “Ghost Trails, Journeys Through a Lifetime,” available at this link. The most funny thing that this creature could be real…yes..from commonly accepted behavioral patterns of lynxes the encounter like that is highly unlikely…but my encounter with bear nearing the top of Yushan mountain in Taiwan was equally unlikely..but it was nonetheless very real…it is just 20 km on trail, not enough to hallucinate I was “lucky” to see that rare to meet creature but honestly I would prefer this thing won’t be there! I’ve spent “minutes, possibly hours”, thoroughly enjoying all of the stories here at “Half Past Done”.